The passing of the August Bank Holiday Weekend is a moment of truth for the cluster of newly graduated actors. Twenty-two drama schools, writes Michael Simkins, “are recognised by the government as fit and proper places in which to train” and they make for several hundred new aspirants. That end-of-second-year show in an Edinburgh basement, an intoxicating triumph at the time, now feels a long way back. Its only trace is a paragraph of a review, hard to locate, and in any case written by a fellow student. The end-of-third-year summer showcase is ten weeks back. 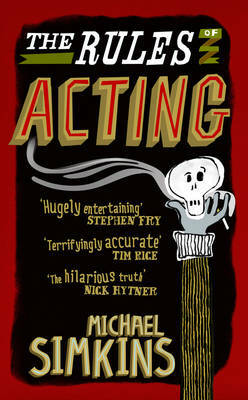 They are, in the Simkins view, “horrid, frightening, sphincter-tightening, occasions at which it’s all too easy to feel like a total loser.” “The Rules of Acting” blends an unblinking realism with an unquenchable optimism and an unfailing chirpiness. But then Michael Simkins is an actor. A veteran of thirty-eight years, since first timorously entering drama school, he has been everywhere. His earlier book, the indispensable “What’s My Motivation?” featured this year on a Radio Four afternoon book programme. The convenor declared, with some superiority, the name of the author to be one that had never quite made it. By this he no doubt meant that the actor had never been a brand-name copper, dissected endless corpses or hailed from the Planet Gallifrey. Simkins has worked, and worked, and worked. He has also written. He even reveals that a major newspaper offered him their vacancy as a drama critic. Partner was all for it, as the job came with regular work, expenses, even enrolment in a corporate pension scheme. Simkins turns it down for the only reason that counts. A friend tells him he’ll dine on the best of food and wine, and he will lose all his mates. Critics don’t have friends. In all likelihood the first paid job for the new graduates is going to be a Christmas show. It is the late November to first-week February season that pays the bills for all that civic-owned, Lottery-over-endowed bricks and concrete. In pantomime actors work. “Cash-strapped managements will squeeze as many performances out of you as they can” he writes. That can be twice a day, six days a week, including “the most exquisite form of torture ever devised for a hung-over actor; the notorious “shoppers matinee.” That is a performance at ten o’clock. In the morning. But for all the changes- he mentions a calamity of an audiobook reading for all to see on Youtube- the actor’s life is still “standing on the outside of society, looking in and pulling faces”. A newspaper asks him to write a feature on whatever became of his RADA class of 1978. Timothy Spall is in the profession still, but many have scattered, one a professor, another a lawyer, one in gaol, another succumbed to mortal illness. But much the same might be observed of the many lives, which start in one direction and undergo switchback turns of fate. The life of the actor is unique, but in this cheering chronicle of truth and hilarity, sadness and dismay over life’s course, it is not so far away from the world of many of us.